Another recipe being shared from UK Health Bloggers is from Sarah at The School of Balance and her Clementine and Cardamon Cake. 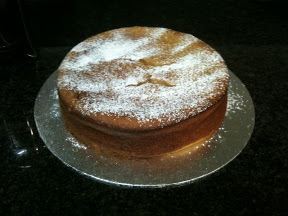 A flour-less cake which is gluten free, dairy free and also refined sugar free. Photograph courtesy of The School of Balance. This entry was posted in Outside Links, Sweets and Treats and tagged Almond, Cake, Cardomon, Clementine, Gluten Free, Healthy Eating, Wheat-Free. Bookmark the permalink.